KENSINGTON, Brooklyn (WABC) -- Police are searching for an armed robber who has been targeting elderly women in Brooklyn and Queens. In an Eyewitness News exclusive, we're hearing from one of the victims, an 84-year-old woman who says she was beaten and attacked in her Brooklyn home. Police say the attacker has been linked to five similar incidents. Erin Van Schendel says she has never been attacked before. She barely even remembers what happened because a 250-pound man hit her so hard and broke her nose. She says she has never felt unsafe in her own home - until now. Erin says she heard a knock at her door, when she answered it, the suspect was standing there. Police say he smashed her face with a handgun, breaking her nose. He never even spoke a word. Now, her face is badly bruised. When she got up off of the floor, the suspect was gone. "He needs somebody to just grab him and put him where he can't get out like jail," Van Schendel said. Police say the large suspect preys on vulnerable victims like elderly women, and has attacked five times in the past several months. 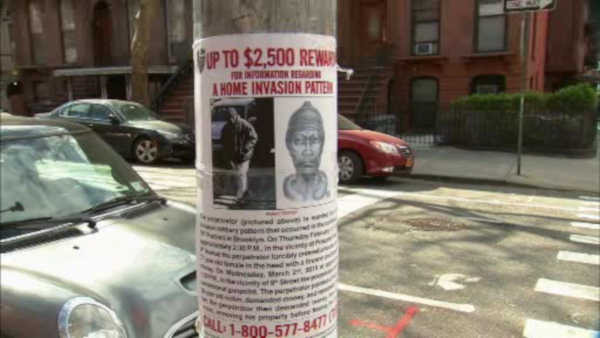 Police say earlier in the month, the man attacked a 91-year-old woman in Park Slope. Police say he approached her with a gun and a box cutter. In February, he pistol-whipped a 71-year-old woman in Park Slope. Erin was attacked Saturday around 4:30 in the afternoon at her home on Ocean Parkway. "I just think it's really sad, and I can't imagine someone hitting a nice old woman who's 84. I just don't know what kind of creep that is," says Marc Van Schendel. Police say the suspect is about 40-60 years old and is 5'10", weighing about 250 pounds. Erin says she buzzed the man in, not knowing who she was. She took the elevator, and he followed her up the stairs. "I'm pretty, pretty nervous. I'm looking around corners and things like that. I didn't have any reason before but now that I see what sort of people are out there close by," Van Schendel said. In each incident the suspect takes off on foot with several hundred dollars in cash. He got nothing in this attack. The victim thinks it was her two Chihuahuas that scared the man off. Borough President Eric Adams is pleading for help. "We have to find this person. This person is among us. There is a photo of him and so we are asking the public please give us information," Adams said. There is a sizable amount of reward money out there for information leading to his arrest. $2,500 from Crime Stoppers and several thousand more from the borough president.